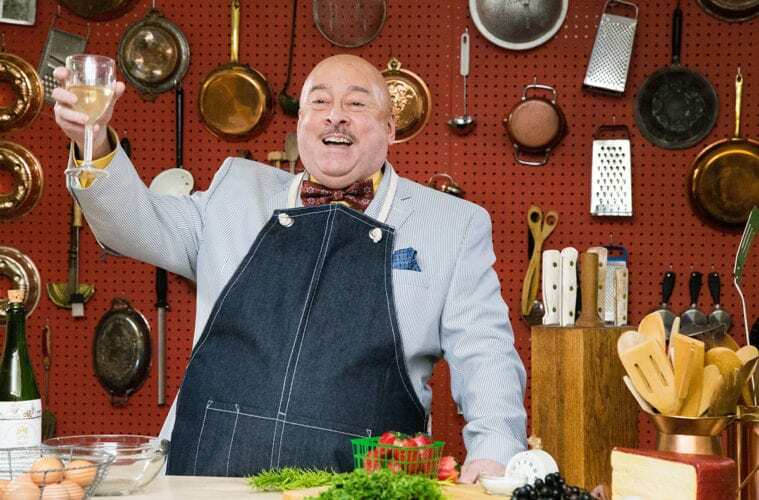 William S. Murphey portrays famed chef James Beard in I Love to Eat at Theatrical Outfit. In reference to his ubiquity in the culinary industry, chef and TV personality James Beard famously referred to himself as the “greatest gastronomic whore.” For his performance in I Love to Eat, actor William S. Murphey uses a slightly less charged metaphor: “He was . . . the Ryan Seacrest of cooking.” By the time those outside the culinary industry make the connection, they’ve already heard Beard’s name in reference to TV shows, cookbooks, appliances, restaurants and the elite James Beard Award. Those who recall his TV show — the first cooking show in existence — will remember a charming extrovert with enthusiasm for the creative act of cooking. 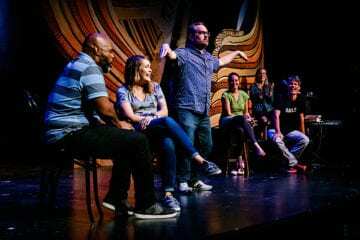 According to James Still’s one-man show I Love to Eat, on stage at Theatrical Outfit April 10–May 5, that is exactly what he was — some of the time. Director Clifton Guterman notes that, like an onion, Beard was a being of many layers, not to mention a very thin skin. The show follows Beard in a stylized version of his kitchen in the middle of the night. Unable to sleep, he does what he does best: cook and talk to his viewers. Beard guides us through his life and career via flashbacks and phone calls from friends and contemporaries; he offers a live, real-time walk-through of one of his famous appetizers for an audience who, if sitting toward the front, might get a literal taste of the action. The premiere is apropos because Atlanta has a growing reputation as a “foodie town.” The city is home to several James Beard Award winners, including chef Steven Satterfield, who has worked with Murphey to make sure the performance is accurate in terms of cooking technique. In a stroke of serendipity, this year’s Beard semifinalists will be selected and named during the run of the show. While the show is intended to reflect Beard and his life, it is not meant to be a biography. Beard began his career trying to break into the opera world and carried that theatricality throughout his food-related pursuits. The design and staging of the production are similarly heightened. Large cable pipes swoop in from the ceiling to hold Beard’s pots and pans, and chandeliers made of whisks and spatulas light the area. The only “person” Beard shares stage time with is a large cow puppet (a callback to the real Elsie puppet, his bovine costar on the television show). Breaks from reality are meant to act as a portrayal of Beard as both a person and a persona. One of the challenges that both Murphey and Guterman describe in the creation of Beard as a character is the challenge of making him something besides what the audience expects him to be. When the audience sees him, he can’t sleep and needs to busy his hands. He misses family and friends and would like to travel. The play also delves into his sundry, unfortunate relationships and his mounting health problems. He wears a lot of faces in his life, and they aren’t all happy ones. The play’s true aim is to show just how many people can fit inside of one human, especially a famous one.